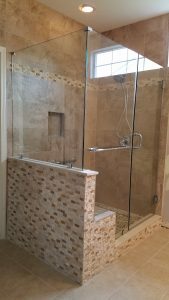 Rogers Glass is a leading supplier of frameless glass showers in the Savannah, Georgia area. The trained and experienced technicians at Rogers Glass take great pride in their work and customer satisfaction remains a top priority. Rogers Glass can provide you with a number of glass options from transparent glass to glass frosted in a variety of patterns. Hardware is available in different styles and finishes as well. From a single shower door to a multi-sided glass enclosure, each installation is carefully measured and the glass is cut to fit. 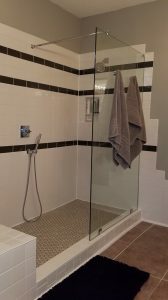 Glass shower panels are cut from 3/8″ or 1/2″ tempered glass, depending on the installation, which makes them incredibly safe and durable. The manufacturing process for tempered glass includes heat treatment that places the outer layers of glass in a state of compression and the inner layers in a state of tension. This process produces an extremely strong glass product when compared with traditional, non-tempered glass. In the extremely rare case of glass breakage, tempered glass doesn’t break into sharp shards like traditional or annealed glass, instead crumbling into much less dangerous granules. Frameless glass showers by Rogers Glass add a high-quality, luxurious alternative to traditional sliding glass shower doors and cumbersome framed swinging shower doors. © 2017 Rogers Glass, LLC.